The problem was with a Glow-worm Micron 30FF boiler which would not fire up and which had both LED lights flashing alternately. 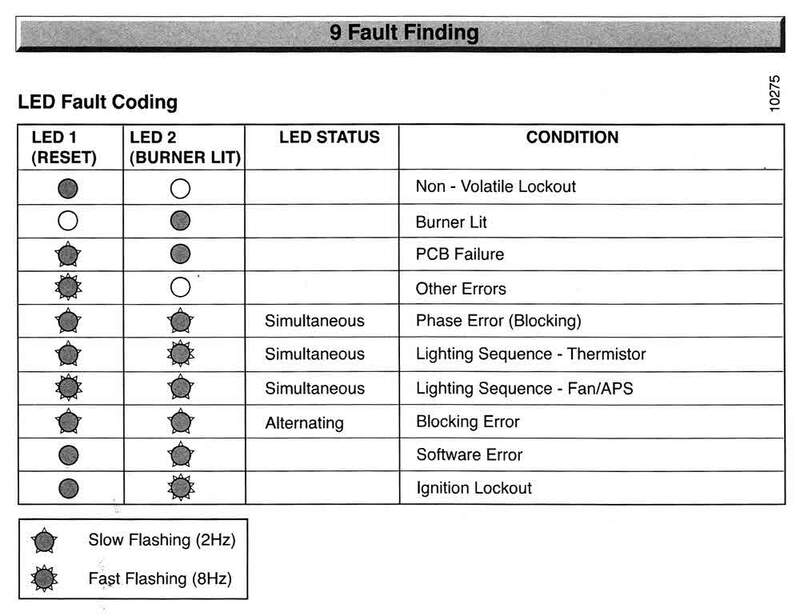 The installation and servicing manual for the Micron FF boiler (Instructions for Use, Installation and Servicing) has a page showing LED fault Coding. Unfortunately, several of the terms used in the fault finding chart are unintelligible nonsense, but we’ll come to those. The chart refers to Slow Flashing and Fast Flashing. Slow Flashing is 2Hz or 2 cycles per second. That’s not slow at all, it’s 20 flashes in 10 seconds and it is countable. Fast Flashing is 80 times in 10 seconds. The fast flash is too fast to count but you should be able to distinguish between the two as it’s four times faster than the slow flash. The Micron 30FF boiler with the problems had both LED 1 and LED 2 flashing alternately, each flashing 20 times in 10 seconds. The chart showed the fault as “Blocking Error”. Glow-worm Technical helped us out with this (and I think they’re embarrassed at the nonsense terms). “Blocking Error” means a software fault which means the PCB has probably failed. They suggested that it could also be a bad earth or a short between the electrode and the burner. “Phase Error (Blocking)” means electrical polarity (boiler wiring) is wrong. “Software Error” means PCB failure. I have no idea what “Other Errors” are! The boiler wouldn’t reset by simply turning the control knob off and on again so we isolated the power to the whole of the heating system for 10 to 15 seconds and then turned the boiler control knob off and on again. This reset the boiler and it fired up. However, it failed again shortly afterwards and we suspect that the PCB will need changing. We’ve left our customer to check whether Glow-worm will offer a fixed fee, guaranteed repair. The manufacturers buy their parts much more cheaply than they sell them to us so it is often better for the customer to try for a fixed fee repair from them. We’ll let you know how this pans out. 20/09/2012 Update: Our customer attempted twice to contact Glow-worm, for a fixed-fee repair. Both calls produced recorded messages which said Glow-worm were very busy. One call lasted 45 minutes, the other call lasted 1 hour. Neither call was successful in getting through the menu system to a real live person. Glow-worm deserve a big thumbs-down. If this is representative of their backup I wouldn’t be recommending a Glow-worm product to anyone. If Glow-worm are permanently too busy they need more staff. If it was only a temporary rush they could have had an answering machine and offered to ring people back. We fitted a replacement PCB for our customer. At present it seems to have cured the problem. 30/09/2012 Update: Whether changing the PCB cured the original “Blocking Error” fault is not clear. We would expect a replacement PCB to cure a PCB fault (if that’s what the Blocking Error fault was). 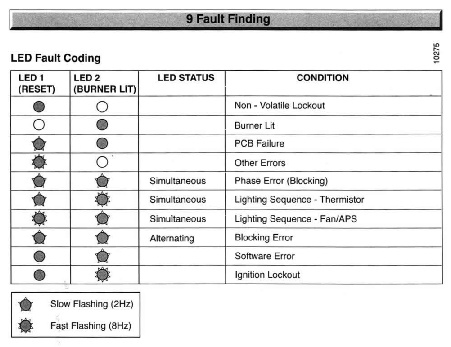 After a few days the new PCB started to produce other fault codes, sometimes an ignition lockout code but more frequently a thermistor fault code with a slow flash on LED 1 and a fast flash on LED 2 (LED 1 is the RESET LED and LED 2 is the BURNER LIT LED). Both LEDs were flashing simultaneously. We fitted a replacement thermistor and once again this appears to have cured the fault but we are waiting to see if this is the case. Once again, we’ll update this page when we have more information. 28/10/2012 Update: Well, four weeks later and the Glow-worm Micron FF boiler (in this case a Micron 30FF) is continuing to work fine with no apparent PCB faults or ignition faults or thermistor faults. Long may it continue!